“Something interesting happened on my way to Oshodi this morning. At the motor park, this rough mean-looking conductor was screaming for passengers, his vernacular oscillating between Yoruba and Pidgin English.”Oshodi! 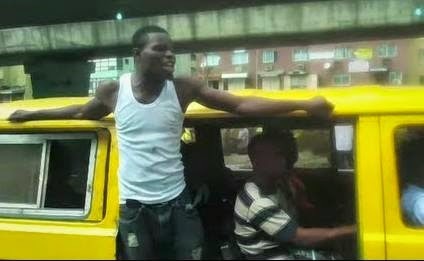 Oshodi!” he shouted angrily as I, along with some other passengers, struggled for seats. There was this beautiful young lady who couldn’t throw caution and decorum to the wind but waited patiently until the bus was almost filled. Then she pleaded to sit by the conductor until somebody came down, when she would have a proper seat. “The bus conductor didn’t even look at her pretty face; he hissed and shouted at the driver to move, while asking the girl why she didn’t rush like the other passengers. The girl started pleading in Yoruba interspersed with English before saying,”I know you are a good man, never mind the fact that you have been shouting”, (that elicited laughter).”Let me sit by your side, please”, she added. “Finally, with much frowning of face the conductor relented and she sat beside him. It was a tight squeeze but she didn’t complain. Instead, she started praising the conductor who in turn started teasing her, speaking (and sometimes spitting by mistake) into her face but the girl never looked away as she kept smiling. He asked her where she worked and she replied that she was a student at the University of Lagos (UNILAG) studying accounting. The conductor teased her in Yoruba about why her boyfriend didn’t drop her at her destination but the young lady laughed it off and continued to gist with the guy in Yoruba. “When she reached her destination, the conductor alighted from the bus for her to come down. She did and paid her transport fare. Then the conductor told her to give him a peck on the cheek for being so ‘gentlemanly’, although he was really not serious about it. Then it happened! The lady jumped forward and gave him a peck on the cheek! She then waved bye and ran down to her street. “The driver and other people began to hail the conductor who started joking, saying he knew he was irresistible etc and others were taunting him. But not long after, the conductor put his head down and became uncharacteristically quiet. The driver soon asked the guy why he wasn’t calling out bus-stops anymore, wondering whether the pretty girl had cast a spell on him. At that point, the conductor said something in Yoruba that I didn’t quite understand and then his voice became emotional and believe it or not, he started to cry. Others were now consoling him in Yoruba. “When I asked what the problem was, the lady beside me explained that the conductor said he just realised he would never be able to get a girl like that in his life because he is an uneducated bus conductor and she was going to be a graduate. He was weeping because he knew no girl of her class might ever do to him what that girl just did, to touch a dirty person like himself; that the girl is nice and well brought-up and that if he had money he would have chased after her. So the passengers were consoling him in Yoruba that he would go higher in life and be able to marry a girl like that and that he should not cry because it was not the end of the road for him. “That really touched me. For a moment in that conductor’s life, his facade of a street thug fell away and he was a vulnerable emotional aspiring young man, just like everybody else.